There are two major events tonight in and around Bagni di Lucca and, as usual, they are on at the same time (9.15 pm) so you’ll have to decide which one to go to. The “Volo Della Farfalla” raises funds for the Rizzoli Institute in Bologna, which is responsible for the research and treatment of bone tumours. 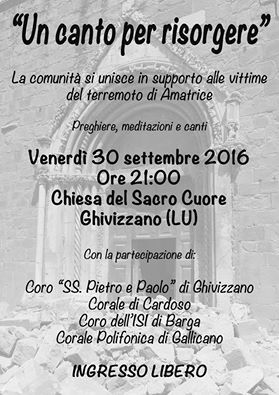 The other event is at nearby lower Ghivizzano and is again given for a charitable cause – the central Italian earthquake which has killed three hundred people and devastated so many communities. So do decide on which charitable event you’ll be thinking of attending if you are in the area or, at the very least please tell your friends and acquaintances about them. 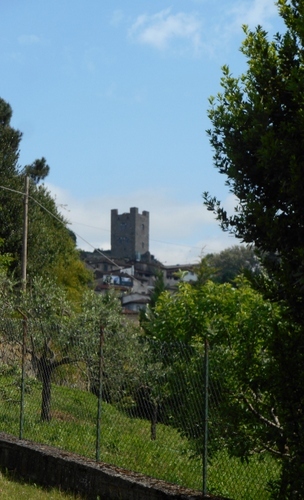 Ghivizzano is usually visited for its upper walled town with the castle tower. 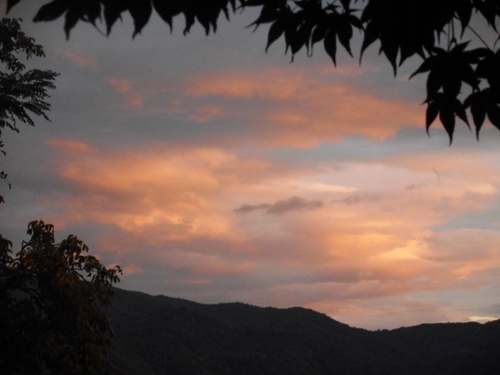 Few people think of spending time in Ghivizzano Basso – that part of the town which lines the road leading to Fornaci di Barga. Yet there’s a lot to see here. Then there’s a new art gallery. Kety Bastiani’s exhibition is continuing at no 116 Via Nazionale, Ghivizzano. It originally formed part of an educational art day’s event held at Ghivizzano castle towards the end of last April in which school children had their art work displayed and were also able to ask questions, via Skype, to Giorgio Michetti, the great Viareggian artist who is now in his one hundred and third year and still going strong (latest exhibition held in Lucca’s Ducal palace in 2012). Kety has now entered into an artistic collaboration with Ghivizzano comune and has installed an art gallery at no 116. I visited the exhibition yesterday and found a development of her technique into further multi-layered compositions. The superimposition of monochrome drawings onto painted works I found particularly effective. The themes of dreams, transformations, the elements, animals, angels and universal love continue to permeate and enlighten Kety’s work which shows an ever more imaginative approach and technique. If you’re at the exhibition don’t forget to visit the amazing Ars Nova artistic store next door in the same building. I had been forewarned by friends about the treasury of paintings that Ars Nova contains but had never attempted to enter its incredible confines. Ars Nova Rossi is a company of craftsmen who are proud to have continued the area’s artistic traditions. It was founded in the 1950s when Tarquinio Rossi opened a workshop for the production of crystal photographs in Ghivizzano, Lucca province. Photo crystallography is a technique which enables slices of crystals to be personalized with one’s photographs. This technique is still carried on but Ars Nova has also branched out into hand prints applied on glass. Sculpture entered its domain in the 1970’s and it’s particularly strong on devotional items such as Christmas cribs and religious icons. Some of the items are still made according to last century’s procedures using clay and papier maché. In the 1980s Ars Nova started collaborting with experienced painters who paint both original works and vintage reproductions. The firm is now managed by Tarquinio’s son Gisberto and his grandson Stefano. When I entered into the store I was greeted by someone I knew – a member of the Ghivizzano choir – and was shown around this extraordinary place. I felt I was in some fantasy scenario – a sort of troll-like workshop for producing the world’s artistic and not-so artistic masterpieces. I’d never seen so many pictures in so many different formats, styles and frames before! Every corner uncovered yet more hidden riches. It is, therefore, entirely appropriate that Kety’s new art gallery for Ghivizzano should be located in the building owned by the Rossi family’s Ars Nova. It’s a truly international business supplying the world with a product that is better than just a printed reproduction but which remains within the pockets of those who can’t afford to dish out thousands (or even millions) in today’s world art market. I wish both Kety and Ars Nova the fullest success in their continuing artistic venture. I realise it’s over three months to go before Christmas but the news I heard yesterday, from a friend that had picked it up from the bar in Equi Terme, is really great: the living crib in that town in the Lunigiana is returning this year after two years’ absence (because of earthquake damage to Equi terme in 2013). I’ll be back in Equi Terme before that since on October 3rd our choir is going to sing in this delightful thermal town’s patron saint festa of St. Francis in the parish church of Saint Francis. 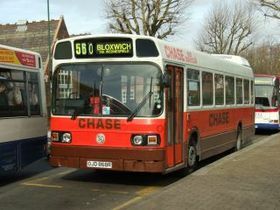 We’ve hired a coach to take our thirty-strong choir for the event. 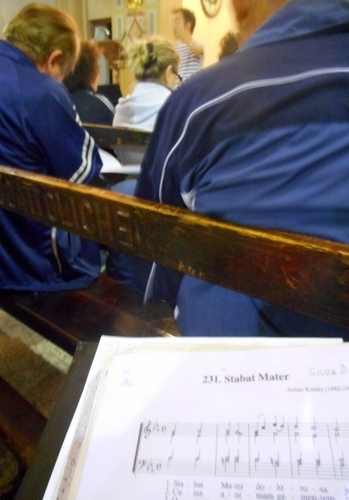 Last night at Ghivizzano church we were busy rehearsing for the concert. It’s good to know that so much of Italy can pick herself up and dust herself down even in the face of calamity. I’m sure the Equi terme festival will be a great success and mark another stage on the way to a complete revitalization of the town and its surrounding area. 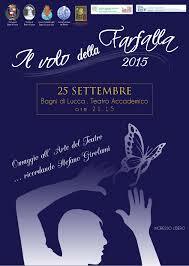 In the meanwhile, tonight at Bagni di Lucca the butterfly flies again. Yes, the show at the Teatro Accademico celebrating the life of Stefano Girolami, a promising theatrical artist from Bagni, returns. If you’re in the area do come along for an event which is always entertaining and serves a very good cause indeed as all the freewill offering from the audience will go to supporting medical research into the disease which cruelly stopped Stefano Girolami. from fulfilling himself. Ghivizzano has two parts to it: alta (high) also known as Castello and bassa (lower). There could be no wider difference in aesthetic attraction between the two parts. The sprawl that constitutes the major part of Ghivizzano bassa is typical of much of the “cementificazione” of modern Italian outer urban centres. There appears to be little attempt at zoning industrial, commercial and residential quarters and American ranch-type villas adjoin warehouse blocks and industrial plants. There seems to be even less effort at any attempt to plan the road system logically so often one finds oneself at a dead-end or a road that peters out into a gravellous waste or stops at the border of a ravine. Having said this, Ghivizzano bassa is, unfortunately necessary to our modern way of living and there are at least two places of interest for those reliant on our consumer age. 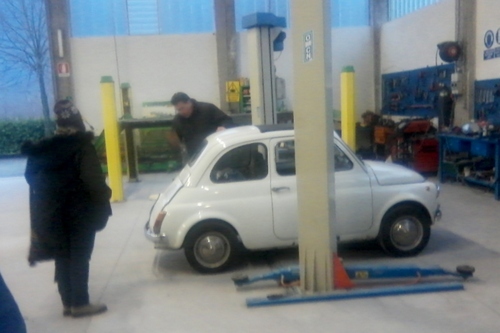 First is the car bodywork (carrozzeria) which was formerly next to Bagni di Lucca’s Conad store. It has moved to more ample quarters at Ghivizzano and is easily reachable by taking the first right before the bend ends after the first stretch of straight road succeeding Calavorno. Thanks to the obsessive habit of Italian drivers to tailgate one the rear of our car was unceremoniously bumped into and not only created some damage in its bodywork but also a mechanical fault (gears and starter motor) which, happily, thanks to the dextrous owner of the establishment was quickly rectified. We shall, however, have to leave the car there in the near future to restore our Cinquina to its correct appearance. Fortunately the tailgater admitted full liability (they couldn’t really do otherwise…) so no complications beyond the standard bureaucratic jungle will have to be faced. 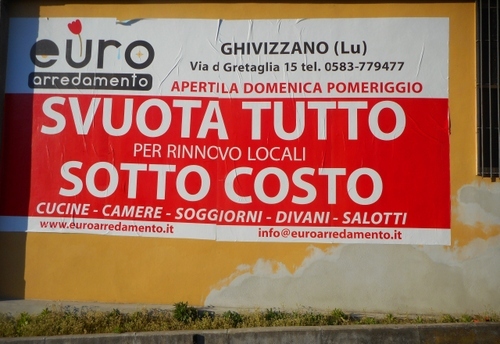 Another place which is a little more difficult to find is Euroarredamenti. Look out for the sign which is placed exactly at the turn off to the right. It may be worth one’s while to sift through what Euroarredamenti have to offer as they are temporarily closing down so as to move all their showrooms on the ground floor. The upper floor at present shows off its range of bedrooms but will soon be devoted to a dance floor and dentistry (!). The prices have been lowered to clear off old stock and bargaining is also admitted. So, despite the ease in which one can get lost in the one-way systems, dead-ends, weird roundabouts and strange chicanes, it may be worth to take the risk and explore what lower Ghivizzano and its industrial estate has to offer. 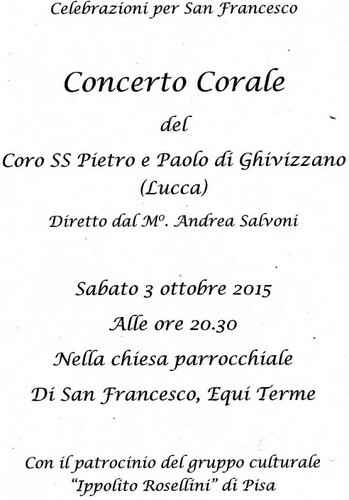 Our choir joined up again on Saturday at 5 pm to sing for a wedding at the church of Ghivizzano Castello. 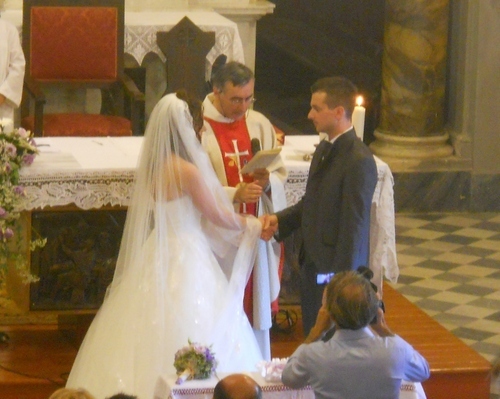 The ceremony went swimmingly and was not interrupted by an earthquake as happened last year at the same place in June. The Triumph Spitfire was a very suitable car to use because, although first brought out in London’s 1962 Motor show and built near Coventry, it was designed by one of the greatest of Italian motor stylist, Giovanni Michelotti, who also designed for Ferrari, Lancia and Maserati. Based on the Triumph Herald, it was another addition to the small sports car market which also included such classics as the Austin-Healey Sprite and the MG Midget. The happy couple’s choice was the Mark IV which was produced between 1970 and 1974.and (then) cost £735. With a 1296 cc engine and a top speed of 90 mph, the Spitfire must have been fun to drive! Fortunately it was a sunny afternoon as the car went through the narrow streets of Ghivizzano Castello to emerge at the town’s eastern gate. On the way to the reception party the car stopped as the main road had been blocked by a white ribbon across it and a table placed in the centre. The couple emerged to receive a glass of bubbly each and toast the start of their new life. Meanwhile, long queues of cars were building up on both sides. Hooting started but I am sure it was just the Italian habit of sounding the horn at newlyweds rather than irate drivers having to wait! At Ghivizzano’s sports centre there was yet another sagra, this time a “Tripe and Old Flavours” one. Although I like the Florentine lampredotto (which is the third stomach of the ruminant cow) I stop at tripe. Returning to Bagni di Lucca, I gave a quick look at the new exhibition by Attiliana Argentieri Zanetti which has opened in the casino. An artist of international reknown, who has also frequently appeared at the Venice Biennale, Attliana creates tapestry which becomes transformed into sculpture. The doors were just closing but I will visit it more thoroughly today. The title is “Arazzi, Nodi della memoria” (tapestry, knots of memory, and it runs until 23 August. Opening times are 5 to 8 PM. This was not yet the end of the day’s events for at Ponte the street is closed and made into a pedestrian “island”. Here a stage has been set up and a blues band made up of two brits and two Italians were performing classic 1960’s and 1970’s pieces which I remembered off my old John Mayall and Chicken shack vinyls. They’d only just formed up but sounded remarkably together. There are so many things happening in this area that one is really spoilt of choice or, as the Italian puts it, “l’imbarazzo della scelta.” What fresh fields and pastures new today then? (As they certainly will be after this morning’s slight storm).